Jim Lynch’s latest book focuses on one of the major threats to the banking industry - customer defection. The tradition of customers remaining loyal to their banks is fast disappearing. The economic and social threads which linked banker and client have become frayed and easily broken by recession and other forces of change. Customer relationships in all sectors are in need of repair, not just economically but psychologically. This book is a guide to bankers and others in financial services on how to forge, renew or strengthen banking relationships. 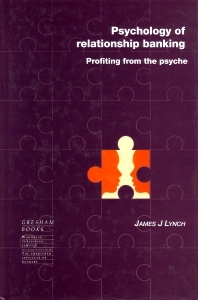 The changing anatomy of banking relationships; The new realities of relationship banking; Rethinking the role of psychology in banking; Psychology of relationship banking; Client profit, the psychological approach; Mapping the corporate psyche; Renewing banking relationship skills; Profiting from sound relationships.